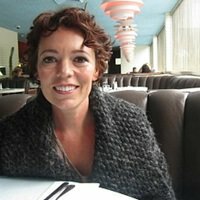 It is common knowledge by now that Olivia Colman is set to replace Claire Foy as Queen Elizabeth in The Crown‘s third season, which will once again chronicle a new decade of her reign. However, that apparently isn’t the only royal ruler Colman will be portraying in the near future. And her latest role definitely offers a unique perspective on life in the monarchy. 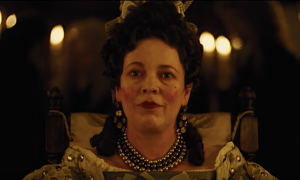 The trailer for Fox Searchlight’s newest projectThe Favourite, finds Colman working alongside the likes of Emma Stone and Rachel Weisz in a zany (and comically absurd) look at British history. Colman stars as Queen Anne, loosely based on the real Queen Anne, who suffered from ill health for a great portion of her 18th century reign. That’s probably why the trailer shows Anne lean so heavily on her good friend, Lady Sarah (Weisz) for council during the stressful political climate (England was at war with France at that time). The video doesn’t offer a ton of details about the overall plot, however, based on the brief snippets from various scenes, it’s clear that life in the palace is utter chaos. Whether the Queen is preparing for yet another duck race or the new servant, Abigail (Stone), is being propositioned to be “stripped and whipped” by a courtier, The Favourite offers a new, never-before-seen take on past royals, while blatantly reveling in its own absurdity. As you can see, this is a far cry from the character Colman will portray on The Crownas Queen Elizabeth. The Netflix series prides itself on its accuracy and staying fairly consistent to real life events that took place throughout the Queen’s reign (The Great Smog, Princess Margaret’s relationship with Peter Townsend, etc.). Of course, some parts were most likely fictionalized for the sake of dramatic storytelling (like Prince Philip’s resistance to kneel during the Queen’s coronation), but the series definitely strives for accuracy whenever it can. The Favourite, however, is taking a somewhat different approach to things and it’s impossible not to enjoy the madness of it all. Perhaps with a different cast, the film wouldn’t able to pull of such a wacky approach to royal life. But Colman, Weisz, and Stone all prove to be comedic gold in the trailer. Nicholas Hoult, Joe Alwyn, James Smith, and Mark Gatiss are also part of the impressive ensemble, though they might be difficult to spot in the trailer, since the majority of the time is rightly given to the three leading ladies. The project is also directed by Yorgos Lanthimos, best known for his work behind The Lobster and The Killing of a Sacred Deer. Weisz’s Sarah says it best at the end of the clip: “Sometimes a lady likes to have some fun.” That’s definitely what this film aims to do and so much more. Social Studies may have been a total snooze fest for you back in school, but The Favouriteis looking to redefine how you think about history. And based on the trailer alone, it could succeed in doing just that. Is it November yet?